Even if you don't consider yourself to be an independent person, living on your own can be a truly satisfying experience. It's a wonderful way to get to know yourself, which in turn strengthens your other relationships, even if they're not sharing living space with you. Choosing an apartment may seem like a simple decision, but you have options of a one-bedroom or a studio. Each one has valuable features, and the solution is to decide which style is more accommodating of your individual lifestyle. Use these questions to evaluate each one side-by-side and find the answer that's right for you. Are you constantly on the go, using your home as mainly a base for sleep and showers? A studio apartment would be an ideal choice for you. If you're more of a homebody or do a lot of entertaining, you could probably use the additional space of a one-bedroom. Don't make the assumption that a one-bedroom has more storage available. Our Springs Apartments studios have large closets, including a walk-in. Some of them also have light and airy loft-style layouts, while others are strategically designed to use kitchens and other elements as natural room dividers. 2. Do You Have a Lot of Furnishings? You may be at a stage where you don't have a lot of possessions, especially if you're a college student or just starting out on your own. 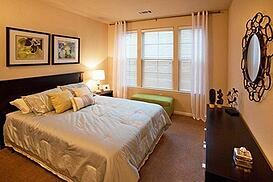 Studio apartments look comfortable and lived-in with only a minimum of furniture and accessories. Most of our communities have 3D floor plans that provide a unique opportunity for you to visualize how your furnishings will look in one of our apartments. Go to the community's website, select the "Floor Plans" tab and click on the "View Floor Plans" link for the corresponding apartment. 3. What Amenities are on Your Wish List? Decide beforehand which amenities are deal-breakers and see if they are included in the one-bedrooms and studios you consider. Depending on what community you're looking at, the apartment may include designer features like in-home washers and dryers, patios and balconies. We also welcome furry, four-legged residents, no matter which style you choose! A studio apartment is going to be less expensive than a one-bedroom apartment, but don't consider price on its own. Depending on your needs and wants, the additional rent in relation to the extra space could be well worth it. Whichever one you choose, be sure to check out our article on "Tips for Optimizing Space in 1-Bedroom and Studio Apartments." You will be surprised at how much extra room you can "create" with a few simple tricks! If you live in a studio or one-bedroom apartment, what was the deciding factor in your decision? Share your thoughts in the comments!